In Taoist cosmology, form is mystical, flux is real, everything is in constant transformation and alive with energy or life force (qi). 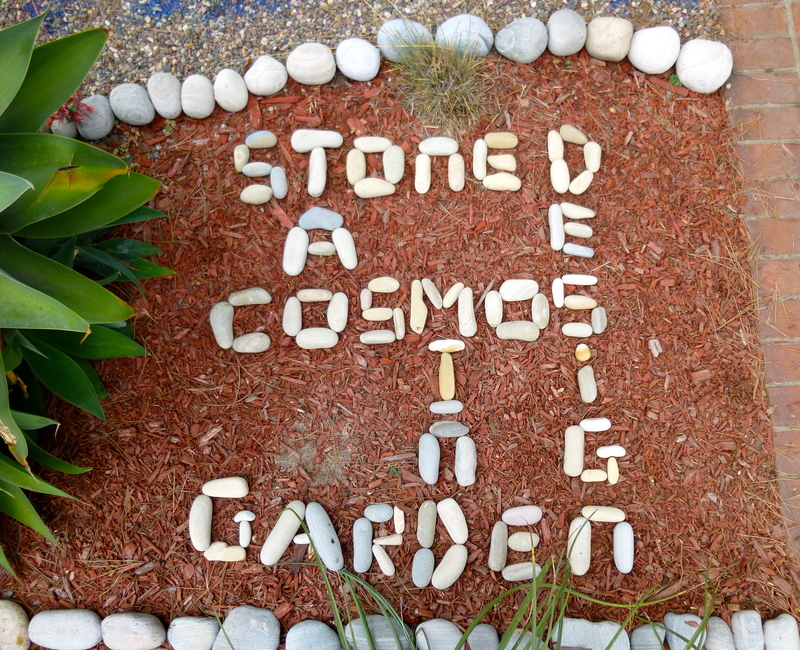 Stones represent the universe in miniature, or more precisely, the inchoate energies that created the universe. They also have alchemical associations with creating elixirs of long life. 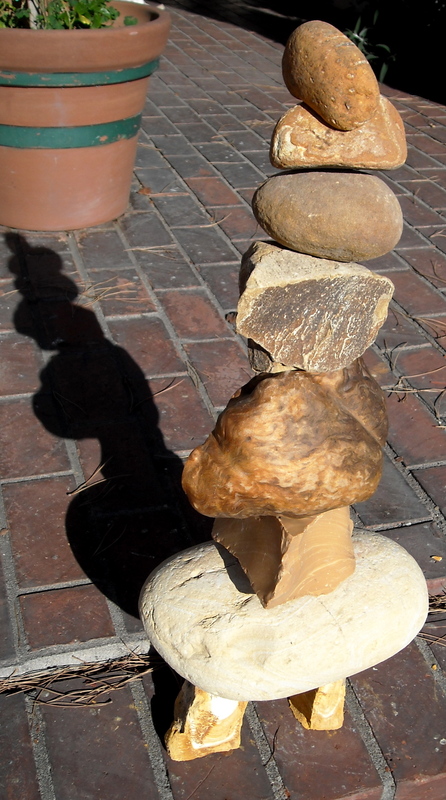 Contemplating stones doesn’t make you go beyond yourself but more into Chan (Zen mind). Chinese scholars created rock gardens, contemplated rocks, and concocted poetry. Pierre Jardin is trying to integrate these vocations. In a continuation of his investigation into petrification and the integration of rock and wood, Pierre made balanced sculptures out of various materials that look like other kinds of materials: wood that looks like stone, stone that looks like wood, glass that looks like stone, and glass that looks like wood. Pierre wrote petriverses using only one vowel to express this merging of materials into common elements. He riffed “knock on wood for good luck” into “rock on wood for good look” and left the viewer wondering WOOD OR ROCK, WHO KNOWS? Pierre Jardin named one side of the Petriverse “Woodstone Forest,” because it features compositions combining rock and wood. Petrification of wood takes ages, but Pierre designed a work to investigate wood and stone turning into one another on a shorter term schedule. In the lovely pine tree that shelters Pierre’s home and shades the garden’s south slope, he ‘planted’ stones in forked branches two years ago, and since then gravity has pulled the stones to earth while the branches continue to grow upwards. 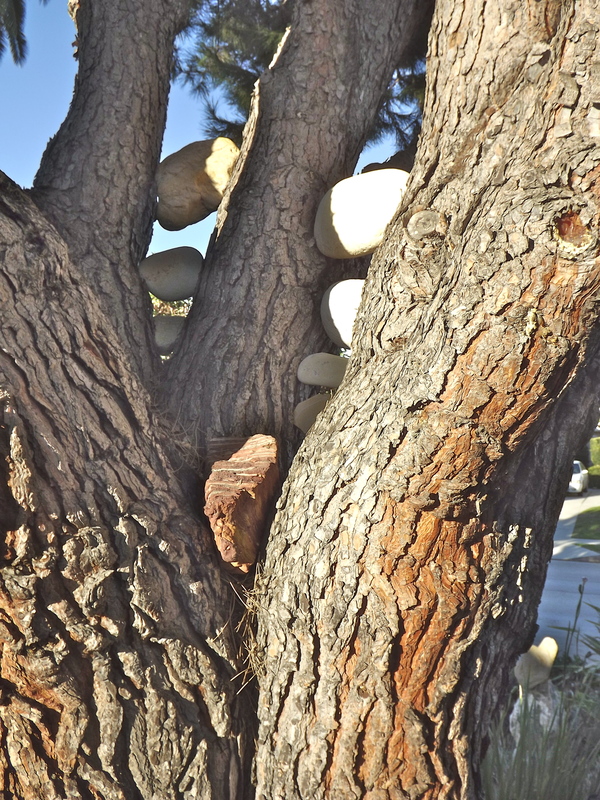 These organic forces have made an amalgam where rock grows into wood; it is impossible to remove the rocks from the tree, leaving the tree a bit vulnerable or fearful feeling, if not fully petrified. The rocks look at home in the tree, and the tree becomes something more from the presence of the rocks. The juxtaposition of rock and wood and growth of them into a single entity expresses the ongoing biological and geological transformations that unfold in time alongside the time of our lives.